The worldwide ship loader & unloader market is relied upon to display a solid development through the span of the estimated time frame. The study of worldwide ship loader & unloader has been minutely examined and researched upon by Transparency Market Research (TMR). The market research report displays a far reaching examination of the worldwide radar market alongside a framework of the opposition existing among the center players working in the market. The competitive scene segment incorporates a few parts of the key players, for example, advancement and improvements center systems, product portfolio, prime work force, region covered, acquisitions, agreements, mergers, and other monetary and non-budgetary techniques. As the players operating in the global ship loader & unloader market strive to present customers with differentiated products in order to sustain in the market, the competition is likely to increase in the years ahead. The companies operating in the market are FLSmidth, AUMUND Group, ZPMC, SMB Group, Sandvik, VIGAN Engineering S.A, NEUERO, AMECO, EMS-Tech, Buhler, and Xinapse Systems Ltd., among others. According to TMR, the global ship loader & unloader market is anticipated to witness a meagre CAGR of 3.1% over the course of the forecast period. On the basis of region, the global ship loader & unloader market has been segmented into North America, Latin America, Europe, Japan, Asia Pacific excluding Japan, and the Middle East and Africa. Among these, Europe is expected to emerge as the leading region in terms of demand and consumption of ship loader. The region is expected to reach a valuation of over US$17,800 Mn by the end of 2026. The growth of the region can be attributed to the rising sea trade from in countries such as Spain, Italy, Russia, the U.K., France, and Germany. The ongoing construction of ports and the need for port material handling equipment that is used for the loading and unloading of bulk cargo is one of the core factors that is expected to trigger the growth of the ship loader & unloader market in Europe. Based on product type, the global ship loader & unloader market has been bifurcated into stationary and mobile. By the end of 2026, there is going to be a close competition between these with valuation and growth rate near to the edge of the other one. On the basis of technology type, the market has been divided into mechanical and pneumatic. Between these two, mechanical led the market in terms of value crossing US$31,800 Mn by 2026 end. However, pneumatic is expected to lead the market over the course of the forecast period in terms of CAGR. 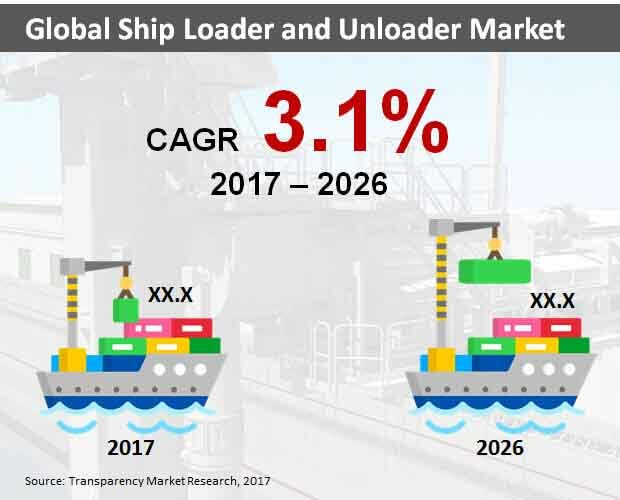 In terms of application, the global ship loader & unloader market has been classified into mining, packaging, construction, manufacturing, sea ports and cargo terminals, and others. Amongst these, mining is expected to dominate the market closely followed by sea ports and cargo terminals. Based on bulk type, the global market for ship loader & unloader has been bifurcated into dry and liquid with dry leading the market throughout the course of the forecast period. The use of ship loader & unloaders more in the dry bulk type other than liquid because they are easy to carry and are hassle free as well.